Kolams are a symbol of auspiciousness. It is Hindu belief that that the geometrical patterns & designs applied with rice flour at the entrance to a home, invites Goddess lakshmi into the household, and drives away the evil spirits. It is mostly a South Indian tradition, practised widely in Tamilnadu. Kolams are also applied daily in the pooja room near the lamps. There are specific kolams attributed to the various deities. Traditionally, the women wash the path in front of the house. (Cowdung is used to clean up the ground, though this practise is no longer in vogue in the cities, mainly because cowdung is not easily available & most entrance path are now laid in cement or tiles.) Finely ground rice powder is then used to apply kolams. This practice is followed in the evenings also. The reason for using rice flour is that we are providing food for the ants & other small insects. 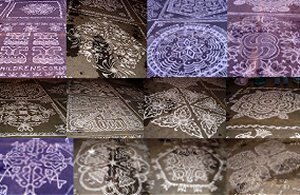 In these days finely ground white stone powder is used, for this is easier to apply & also the kolams are brighter & well finished. Even if ground stone powder is used, one could mix rice flour in it. Kaavi (brick red powder) is applied as an outline, especially on special occasions and pooja days. 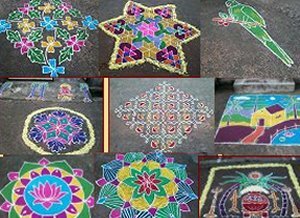 In places, where there is a great gathering of people & movement, rice paste made by mixing rice flour with little water is used to apply kolams. This is to ensure that the kolams are not rubbed off easily. This is especially applied in temples & wedding halls. During Krishna Jayanthi, tiny feet symbols are drawn using the rice paste from the entrance of the house leading upto the pooja room, where the sweets made for the occasion are placed. It is assumed that child Lord Krishna walks into each house & partakes of the meal provided. 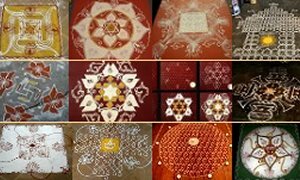 The month of margazhi (mid Dec) is a gala time for all kolam lovers in the cities and villages. Women start applying huge beautiful kolams very early in the morning undaunted by the chill morning dew. 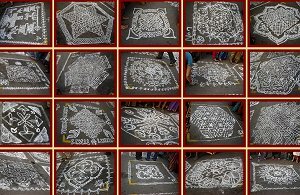 They start learning kolams and make preparations overnight testing the kolam on paper so that they can do a perfect job the next morning. There is a healthy competition in each street, each trying to outdo the others. 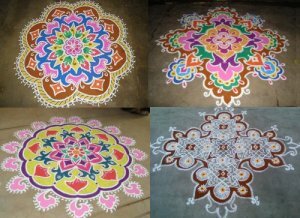 The current trend is to create colourful rangolis (rang - colour in Hindi) applying colour powders to fill up the white outlines. 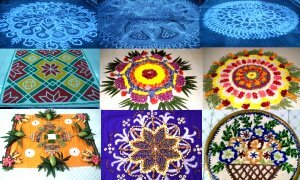 Kolams are known by different names in different parts of India. Hase in Karnataka, muggulu in Andrapradesh, chowkpurna in Uttar Pradesh, alpana in Bengal and Assam, and rangoli in Gujarat and Maharashtra. 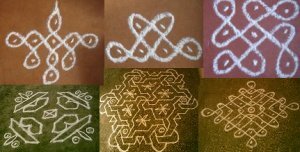 There are several types of kolam designs - line kolams, the free hand drawing of lines to make a geometrical pattern. 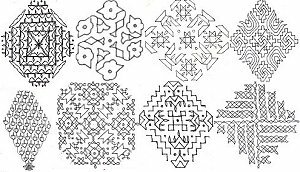 Pulli (dots) are arranged in a specific sequence and order & these pullis are joined to make pictorial designs. - joining the dots with straight lines to create the pattern. - forming of twisted chains by linking one loop with the next & forming wonderful designs. 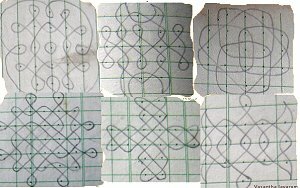 This is called Neli, chikku, sikku, kambi or chuzhi kolam. Plates, Boxes are available with the designs etched as tiny holes. When these are filled with kolam powder & tapped on the ground, you have a lovely kolam. Rollers are also availabe. The rollers are filled with kolam powder & rolled/dragged to create lines orpatterns, and with a little imagination a kolam of your choice can be executed. 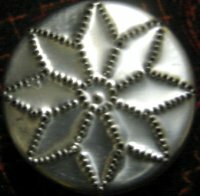 The 1st image is a kolam box made of steel. 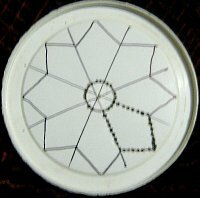 The 2nd image is a hand made plate, the dots pierced using a sharp hot nail on a plastic lid and the third image is the result using the plastic kolam plate..